Autumn is definitely kicking in and the garden is festooned with dewy cobwebs like gossamer bunting. I’ve had a very busy summer editioning other peoples work whilst working hard to produce fresh new work for the Devon Guild’s Botanical-themed shop, Double Elephant’s exhibitions and Devon Open Studios. I had to squeeze in a five day long trip to Dundee with Double Elephant (see item 6) and all the while my wee Etsy shop has been ticking over nicely. It would be nice to take a belated summer break but I still have a couple of projects to tackle, as you will see below. This is a first for me!! Rather than sitting in the comfort of my own studio waiting for people to visit me, I’m taking a leap out into the unknown and have hired a stand at the Windsor Contemporary Art Fair – and hope that people will visit me there. I also have some “admits two for one tickets”. Please let me know ASAP you would like one. As part of the Windsor Contemporary Art Fair, I have also been asked to contribute artwork on a mini canvas to be sold for The Prince’s Trust. 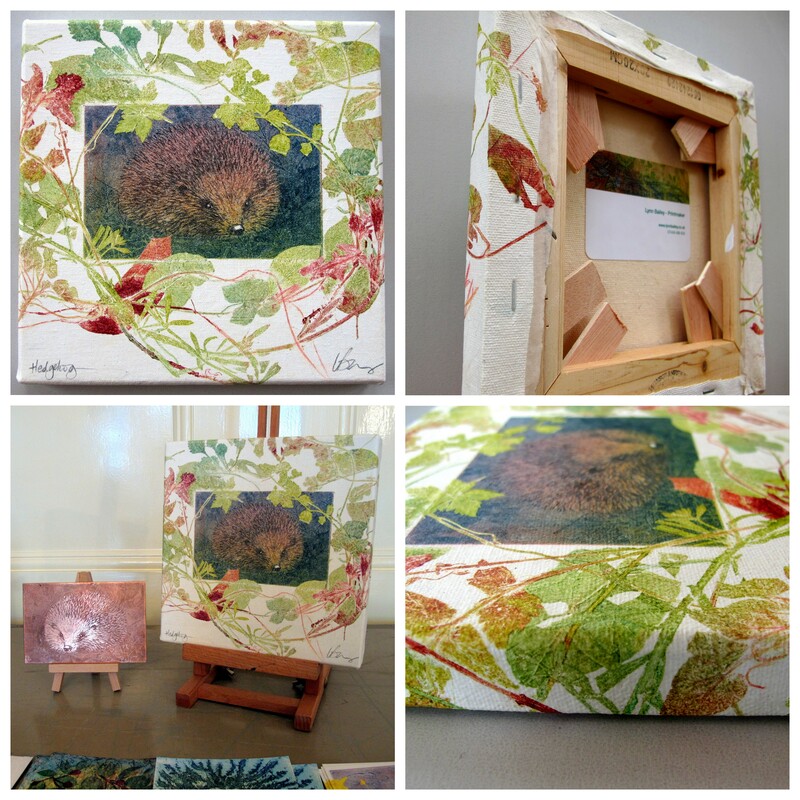 Not easy to put a prepared canvas on a wooden stretcher through an etching press, so I printed my Hedgehog etching with some fresh weeds onto some nice Japanese tissue paper and pasted it onto the canvas. Here’s the results. All mini canvases will be sold at the Windsor Contemporary Art Fair on a first come first served basis for a very modest £40 each. I’m only hiring a small stand at WCAF, but I’ve been scrabbling about with a tape measure and some graph paper, and it’s surprising how much artwork you can fit in if you try hard enough! As part of Gloucestershire Printmaking Co-operative’s Impress ’13 International Printmaking Festival earlier this year, Luis Lara and Yamilys Jorge from Cuba’s premier printmaking studio, Taller Experimental de Grafica, visited Double Elephant Print Workshop. And now, as a part on an ongoing relationship with Taller Experimental de Grafica three South West print workshops are sending prints to Havana for exhibition in November. The workshops involved are Gloucestershire Printmaking Co-operative; Spike Print Studio; and Double Elephant. Each workshop is sending out 7 prints and I am one of the lucky ones from Double Elephant. The print I am sending is one of my Nettles for Red Admirals. Very similar to the one I used in Newsletter number 4 to illustrate by piece about Botanical Discoveries at the Devon Guild. In 2014 the Devon Guild of Craftsmen will be hosting a Maker’s exchange exhibition in the Riverside Gallery showcasing selected work from ‘The Makers Guild in Wales’ from the 10th May – 23rd June. In return Devon Guild members have an opportunity to be exhibited at the ‘Makers Guild in Wales’. I am one of the Devon members being asked to supply work for selection, and selected members will be informed by the 30th November. This is the first time that I have been selected by the guild in this way, so fingers crossed that the Cardiff people like what I’ve got. I see this opportunity as a real endorsement for my work and I will be chuffed to bits if my work is selected to represent Devon printmaking in Cardiff. I have been asked to donate a bit of artwork for The Royal Albert Memorial Museum so that they can raise some funds to purchase a portrait by Sir Joshua Reynolds. The portrait is of Devon born artist, Francis Hayman (1707 – 1776) who was a founder of the Royal Academy. Realising that this is probably the easiest way for me to get to exhibit in one of the shiny new galleries at Exeter’s award winning museum I have decided to say yes! The Art Auction will be held in March - so more about that in the next newsletter. All contributed artworks will be in the new “Gallery 20” for a couple of days before the auction. I wonder who I shall be hanging with? They will need a few decent names as well as “affordable” artists to attract sufficient money to buy a Reynolds. My plans to produce an art project focused on the Roof Top Bees on Princesshay are still in the pipeline. I just don’t have much to report yet. No doubt little sneaky-peeks will pop up on FaceBook &/or Twitter as things happen. AND don’t forget – there are always plenty of courses throughout the year. We had a course planning meeting on a couple of days ago so new dates for 2014 will be on the website very soon. I do hope you enjoy receiving my newsletters. Don't forget to get in touch if you would like a ticket to the Windsor Contemporary Art Fair. And thank you for the enouragement I have recieved from so many people via FaceBook, Twitter and in person during what has really been a hectic summer. Copyright © 2012 Lynn Bailey, All rights reserved. You are receiving this email because you have either recently signed up to receiving my news bulletins, you are on my old email list or have signed a comments book at one of my exhibitions, opens studio events. If you would like to be removed from my mailing list, please reply with “unsubscribe” in the subject baror click on the unsubscribe link below. Thank you.